These bracelets were made with flat, clear, glass marbles that you can find in the floral section of a craft store. They are really easy to make and the marbles provide this cool magnifying effect on the picture you put behind it. 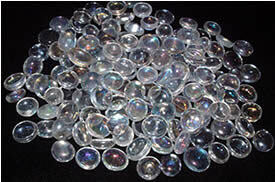 Buy a bunch of clear, flat, glass marbles. Cut out some interesting images as 1/2" circles. I used old comic books for the bracelets above. If you plan on making lots of these, you can buy a 1/2" circle hole punch at a craft store and just punch out the images. Apply a little glue to the back of the marble and press the image against the back of the marble. I use "Gem-Tac" glue because it's decribed as glue for attaching "gems" to fabric. Anything from a craft store like this should work fine. When the glue dries, I then glue on a 1/2" circle that I cut out of vellum to the back of the image to protect the picture from the next thing you'll glue it to. Now you just need to decide what to glue your picture marbles to. You can use small circular magnets, or a blank bracelet form, or a barrette, or whatever. I use a really strong glue, namely E-6000 (available at a hardware store or craft store) for this stage so that marble is sure to stay attached. Blank bracelet forms like this can be found at Rings & Things http://www.rings-things.com, Ornamental Resources http://www.ornabead.com, etc. you can check the jewelry findings section at your local craft store for similar components. I buy mine at Ornamental Resources. Ooh! I can't WAIT to make one of these! I MUST find an empty bracelet today! Hee. I love this idea so much that I had to go out immediately and get supplies. Couldn't find any bracelet forms so I made barrettes. The images I used were from a Japanese Doraemon paper craft book. It was thick paper so I didn't back them with anything. I think it would look nicer if I covered the bare barrette in ribbon before attaching the marbles. I'll probably do that next time. I'm going to Wal-Mart today to get the supplies.. I'll post what I make. Your's are a adorable. I love them. Those are a few things I have made. I love the idea!! I am no making tons of marble magnets.. those will come next. That is such a cute idea! I've seen these in boutiques for a ton of money except sometimes the designs are kinda old fashioned, patriotic themes and what not. Have you tried this with rings yet? Just wondering. I can't see your pictures. Are those URLs correct? really?! i can see them? .. they are w/my gummi bear bracelet.. is that not viewable either? yikes. should i just delete this msg? maybe yahoo albums wont let me directlink? anybody know? free web hosts like geocities, tripod and the like don't allow hotlinking (hosting a pix on one server and trying to bring it up elsewhere because of bandwidth issues) so I imagine Yahoo albums is the same way.